When it comes time to fish the X Zone Swammer, there are various ways you can rig it up. 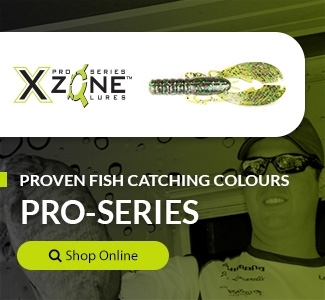 Weather it be an Underspin, a jig head, a swim jig or a weighted hook, the X Zone Swammer can be fished anytime. Rig up a 4" Pro Series Swammer on a 1/4oz Underspin, and fish it around docks or weedbeds on 8 - 10lb fluoro with a medium or medium / heavy action rod. The bite on an Underspin is quick and fierce, so be prepared to get the rod pulled out of your hands! Another way that many anglers rig the Swammer is on a Panfish Ball Head Jig. The Ball Head Jig gives you that weight needed for long casts, and it allows you to either cast and retrieve the Swammer at a steady pace, or let it sink and hop it along the bottom. The Panfish Ball Head Jig is available in 1/32, 1/16 and 1/8oz. For a closer look at the X Zone Swammer, check out this underwater footage!